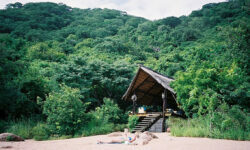 Tucked in lush vegetation Domwe Island Adventure Camp is exclusive yet basic. Camp is run on a self catering basis where guests can make use of the kitchen and facilities to prepare their own meals. 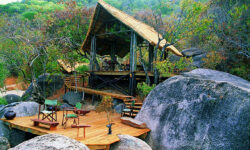 Only 3 largely fully furnished safari tents and 2 tent suites with their own shaed hammocks and decks. ( Guests can also bring their own tents ). The all dining , bar areas are wooden thatch blending into the natural environment. 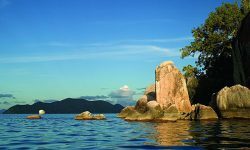 A great camp for bird watching safaris, water sports, snorkelling. Being eco friendly the Camp has no electricity and is run with solar, paraffin lamps and wind up torches.